Renovated two bedroom two bathroom family friendly townhouse with private hot tub in the heart of Whistler. While this is a property we rent out it is also one that we use and we have done our best to ensure that everything guests (and ourselves) need to enjoy their getaway is on hand. We are close to the lifts in the winter either through a free shuttle (that is almost outside our front door) or via a walk through the village. In the summer it is a quick ride right to the bike park along the Valley Trail and we are also walking distance to the Whistler Driving Range and the Whistler Golf Course - very nice feature (10 minute walk maximum). Master Bedroom has a Queen Size Westin heavenly bed/wall mounted TV and DVD (plus Sony PS2) and attached full bath/shower en-suite and private deck looking up to the Ski Hills. Second bedroom offers bunk beds with a double on the bottom (can accommodate adults) and a single on top. Second bathroom is on a split landing which is easily accessed from living room as well as second bathroom. The private hot tub (brand new June 2016) located off the main balcony offers peek a boo views of the mountains but more importantly convenience as it is just off the living areas. We also have a bbq and outdoor eating area on this deck for summer/winter enjoyment. Upstairs on the second deck off of the master we have an outdoor sofa with umbrella (usage weather dependent). The unit does have stairs leading from the front door to the main living/dining areas so is not ideal for those with mobility issues. We have about a dozen board games available for renters use and also have a sony playstation upstairs should there be any gamers visiting. For guests with children we do have a baby gate and an older high chair available for use (please note while we do our best to ensure proper working order we do not check condition between every rental so use is at renters discretion), a play and pack can also be available with advance notice. We have one free parking spot for renters use otherwise there is visitors available but it is on first come first serve and is not guaranteed in the south building. This unit was recently updated (new kitchen appliances, new air conditioners, new counters/fixtures throughout unit, new plumbing, new blinds, new decks surfacing and new carpets etc.) and is the perfect spot to relax while enjoying everything Whistler has to offer. We love Whistler and we hope you do as well. - No booking is confirmed until we have emailed you directly to confirm your reservation this is true even if Credit Card details were entered (that is a hold that VRBO puts in place on your card but does not secure the unit). - VRBO/Homeaway/Expedia Customer service cannot via phone or on email accept reservations on our behalf and entering your credit card details into the portal to request a booking does not complete a reservation (as we may have several pending at the same time from prospective guests). This is how VRBO has set up their booking system and we do our best to work within it. We use the VRBO portal to make renting our townhouse as seamless as possible for our guests so please contact us with any concerns. We thank for your understanding in advance! We love travelling and have used the VRBO site many times over the past few years. Having skiied and snowboarded throughout our lives Whistler was a dream location for us to purchase in. We hope to offer our guests a comfortable and convenient stay while in Whistler! Our townhouse offers a great mix of location and comfort. Close to the Village and all the amenities but also indoor and outdoor space to enjoy some quiet time after a day on the hill or in the bike park. Guests (and we!) love the private decks including the new hot tub and the upper deck off the master bedroom as a getaway to enjoy an evening glass of wine or cocktail before heading into the Village for dinner. In the summer we often walk to the driving range or Whistler Golf course to test our golf skills so there's really something for everyone! Private Hot tub, two private decks and updated interior. We have a split level unit with two full bathrooms which is very nice for a family or two couples so you are not in each others space all week. Walking distance to everything Whistler has to offer - once you are here no need for a car! Two full bathrooms, both upgraded spring 2016 - one is accessible only through master and second is located between living room floor and bedroom floor. Both bathrooms have new counters, fixtures and toilets. We are located in Village North across the street from the IGA marketplace and the start of the pedestrian village. You do not need a car once at our townhouse and free shuttle to lift or walk. Directly across the street from the IGA Marketplace (grocery/pharmacy/liquor store etc) and Whistler Village. We have beautiful views of both Whistler and Blackcomb from our decks. There are brand new (June 2016) wall mounted Air Conditioning units in both the master and second bedroom. These also operate as fans if you just want some fresh air. Gas fireplace for living/dining room and baseboards in the upstairs bedrooms. Fresh linens are on the beds for every stay - we also have a very well stocked linen closet located on the top floor landing between the bedrooms with lots of extra towels and sheets. New Washer Dryer June 2017 and a hanging dry rack on the side. Hot tub and bathroom towels are provided - we have lots! Living room and dining room are attached and open concept - very comfortable for lounging/hanging out after a nice day on the hill or exploring Whistler! Basics are all there plus lots of extras. Tons of dishes as well as plastic sets for the kids. The table is set up for 4 but there is an extra leaf inset in it which is pulled up and two chairs in living room. We also have a small childs booster/highchair available. Please message for photo. Located in Master Bedroom - DVDs are in the entry closet. We have a few books available in the front hall closet depending on what is taken and left behind with different renters! For children we have nighttime books in the second bedroom bedside table. We have about a dozen board games are in the entry closet on the top shelf. We have a small ring toss for small children as well as some books upstairs in the second bedroom for nighttime reading. We also have an older slip and slide and a new magic carpet to use tobogganing. We have a few DVDs that can be watched upstairs in the master bedroom as that is where the dvd player is. A few video games with the PS2 that is located in the master bedroom drawers. Our complex has a large grassy area and lots of space for people to enjoy - it is about 10 units down from ours. We have a covered deck off the living room where the Hot Tub, BBQ and outdoor eating table are. Upstairs we have an open air deck with an outdoor sofa to enjoy when the weather is nice! Located 5-10 minute walk from village gondolas or take the free shuttle which picks up directly across the street! No need to take the car! There is a tennis and raquet club located directly behind our complex - please call them directly to inquire about bookings. Whistler has beautiful golf courses - the closest would be the Whistler Golf Club which is located about 3 minutes away by car or a nice 10 minute walk to either the golf course or driving range. Our unit is on the second and third floors of the building so not ideal for those with limited mobility. There is a dry sauna in the complex in the building attached to the communal hot tub and pool however it does look pretty worn - it does work though! Communal Pool and Spa at Glacier's Reach is open for Winter 2018 (need communal key to enter). There is a brand new private hot tub on our deck as well as the communal hot tub/spa in the center of the Glacier's Reach complex. We love hosting people at our Whistler home and do our best to leave little things to enhance your stay. If you are travelling with children we are happy to recommend some trusted babysitters. Please reach out with any questions while planning your vacation! 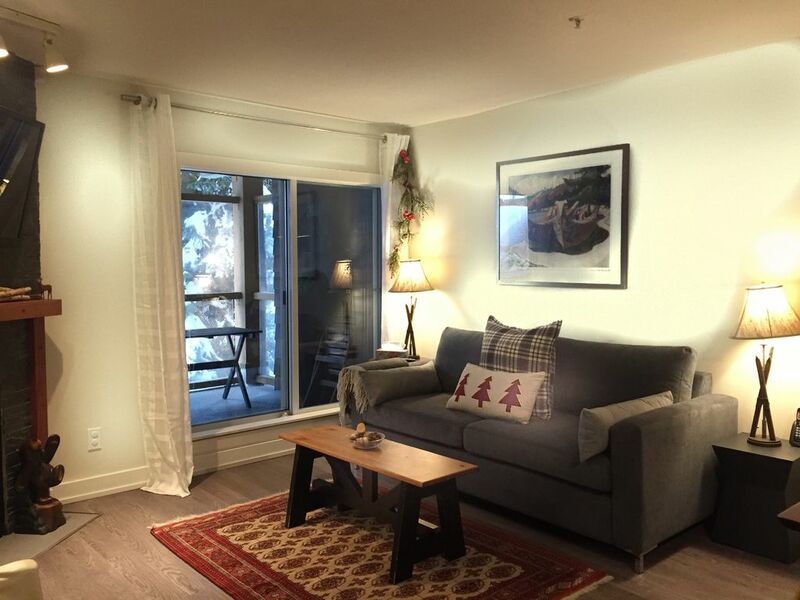 We enjoyed some spring skiing at Whistler and Blackcomb and this townhouse has easy access to Whistler village (stroll starts across the street) or by short shuttle. The shuttle stop is just across the street and you are at gondola base within 5 minutes. There is also a grocery store and BC liquor store across the street at the Marketplace. We left the car in the garage and walked or used the shuttle the entire time. The townhouse was clean and a decent size for our family of 4 adults. It has 2 full bathrooms, so all of us can get ready without waiting. It also has a private hot tub on the deck that we used every night after skiing. There is also a great upper level deck that gets the morning/afternoon sun. Great place to sit and relax with some cheese and wine. The owner Shannon was great at responding to any questions we had and gave recommendations for dinner. The kitchen had everything we needed for making our breakfast and dinners as well. The beds were comfortable and we all slept well. It was a great place to stay and we enjoyed our vacation very much. Communication with the owner was always quick, easy, and pleasant. The condo is in a fabulous location--quiet, but close to everything, including the grocery, liquor, and drug stores. Right across the street from the free shuttle stop to the lifts, but not a long walk, either. (We discovered the free ski/board valet in the basement of the Carleton Lodge where we could store equipment overnight.) The condo is cozy and had everything we needed for five adults--plenty of toilet paper, paper towels, garbage bags, bath towels and hot tub towels. The kitchen is well-equipped, the WiFi works well, and there are puzzles and games available to use. The hot tub is fabulous! Thanks so much for helping us have a wonderful trip. Excellent condo experience. Convenient access both to Whistler Village as well as the ski shuttle. We never had to wait more than a minute or two for the shuttle to pick up/drop off. Once we parked our car, we never used it again. We enjoyed the private hot tub daily, and the condo otherwise was cutely appointed and was appropriately stocked. Super nice, clean, convenient! Friendly and helpful host! We had a great time and would stay here again! We are conveniently across the street from a large grocery store, pharmacy, liquor store and other fun shops. The renowned Whistler Village is also across the street which is a pedestrian only shopping/entertainment area that you can walk and enjoy all that Whistler has to offer. For skiiers - you can walk to the lifts through the village or hop on the free shuttle that picks up pretty much directly across the street from our unit. Any questions - please ask we are here to help make your vacation the best it can be! For parents looking for babysitters I can recommend a few local services that my friends use and have been very happy with. Being so close to the village means you are never more than 10-15 minutes away from great skiing, shopping, pubs and world class restaurants. Rates are subject to change until reservation is confirmed by us directly via email. VRBO nor Homeaway customer service can guarantee our units availability over the phone or email, only we can so please do not book flights, rental cars etc. until we have corresponded. Reference will be required prior to booking. Please note that all reservations confirm acceptance of our house rules which are sent through this site prior to booking. Any questions please ask!